Dead Puzzling by Sue Birch, a Mysterious Review. Review: Suspense, Death, Questions: these are three topics that show up in Dead Puzzling, a children's thriller written by Sue Birch. Three kids, Lizzie Pickles, her little brother Oliver, who has been diagnosed with Asperger Syndrome, and best friend Tom White, join together in an attempt to solve a murder in their town. Can they solve it though, with Oliver's unpredictable behavior? One dark night the church cemetery keeper can't find his gardening shears only to find them stabbed into the back of an unknown visitor. He had been murdered! The next day Lizzie was talking with Oliver's teachers, he was in trouble again. He wouldn't do anything teachers had asked him. He would only do whatever he felt. Then news got over to the school about the murder, so to prevent a nervous breakdown, the whole school was let out early. With nothing to do Lizzie, Oliver and their friend Tom, decided to hang out and talk about this murder. Tom and Lizzie had always wanted to solve a mystery so the thought that they might as well try. Little did they know that this was the start of the greatest adventure they would ever have. Secrets are told and learned, nobody is who they seem, nobody can be trusted not even the police. Can they figure this out before, someone gets hurt, or will they die in the process? The author says that the book is appropriate for children 8 to 13 years of age. I agree because there are parts of the book that are perfect for that specific age group. Also it doesn't go into detail about the condition of the body after they were killed so it won't frighten 8 year olds who get squirmy with dead bodies. The mystery part of it was excellent; it was almost a little like young Hercule Poirot and friends. The inquiries the kids made with their main suspects made it seem very professional. Also Oliver's antics would even make the most straight-faced person chuckle. In the end I would give this book 4 stars, due to its heavy mystery content, and its comedic sense that lightened up what seemed to be a dark story. 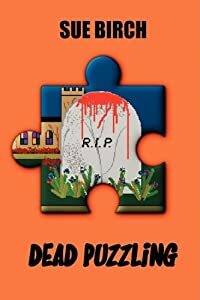 Special thanks to Alex Nauert for contributing his review of Dead Puzzling. Acknowledgment: Sue Birch provided a copy of Dead Puzzling for this review.